I avoid discussing incipient spins at the same time as fully developed spins to make it quite clear that the recommended recovery actions are quite different. Let’s see what CASA has to say on the subject in their Flight Instructor Manual. 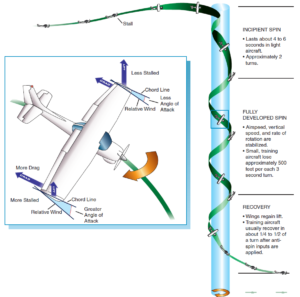 “There’s an interesting characteristic of angle of attack in most general aviation aircraft: critical AoA, the onset of a stall, begins at a 17 degree AoA or so, but maximum lift development occurs just before reaching the critical angle of attack.” Hmmm – a different definition of critical angle perhaps? Unfortunately, some CASA documents refer to this as an incipient spin! It is but it isn’t really! Power can also aggravate the autorotation if the pilot mishandles the other actions. 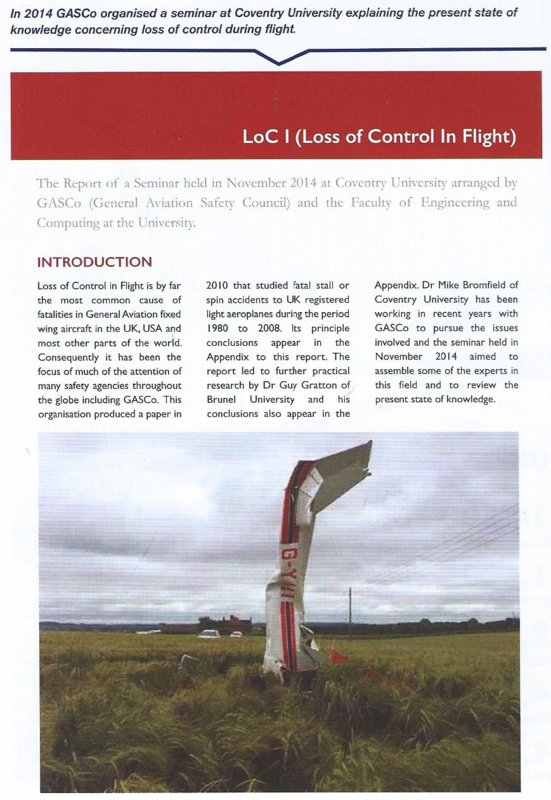 Let’s see what CASA has published in their CAAP 155-1 Aerobatics: absolutely nothing on incipient spin recovery! It seems that we must go to the USA’s FAA Airplane Flying Handbook free online at https://www.faa.gov/regulations_policies/handbooks_manuals/aircraft/airplane_handbook/ for a definition of an incipient spin. It is interesting that, in Chapter 4 Slow Flight, Stalls, and Spins, they discuss cross-control stalls including a skidding turn which still does not feature in CASA’s documentation. The APS Emergency Maneuver Training Pilot Training Manual is also a good resource which is free online. PUSH: Reduce AOA (forward movement of the control column) to allow the wing to reduce AOA below critical AOA, reduce drag and to immediately transition from stalled fight to normal unstalled flight. Common tendencies are to either over-push causing excess nose drop below the horizon increasing altitude loss or a fore-aft pumping motion of the yoke causing one or more secondary stalls. POWER: Smoothly add up to full power (usually) to increase airspeed and minimize altitude loss. We can do stall recoveries all day with the power at idle, however, an idle power setting is not assisting us in minimizing altitude loss. Keep in mind that there are certain situations that selecting power to idle in the stall recovery is the proper action. Examples include high-torque single-engine prop aircraft and in a Vmc situation in a multi-engine aircraft. RUDDER: If there is any roll/yaw motion associated with the initial stall and the wing is still at or beyond critical AOA, the rudder should be used to stop the yaw-roll couple from developing. The amount of rudder used is only enough to coordinate the flight condition and should be accomplished in one application. Pumping or cycling the rudder is not a desirable technique especially for large aircraft. Note that the rudder is not used to roll the aircraft wings-level in a stall recovery. Common errors in the use of rudder vary from not using it all to using it far too much, for too long. Rudder is critically important in an uncoordinated stall condition (such as a cross-controlled stall) to ensure the stall is not allowed to develop from a stall to a spin. ROLL: When the wings are clearly unstalled and coordinated flight has been regained. The aircraft’s flight attitude must be immediately be re-oriented to a wing’s level condition by rolling with aileron and coordinated rudder to the nearest horizon. Again, the aircraft should not be rolled by use of rudder alone at this stage. The primary roll control in normal flight is through the proper use of ailerons. CLIMB: With the wings level in coordinated flight, aft yoke movement should be immediately applied to initiate recovery to a climbing attitude. 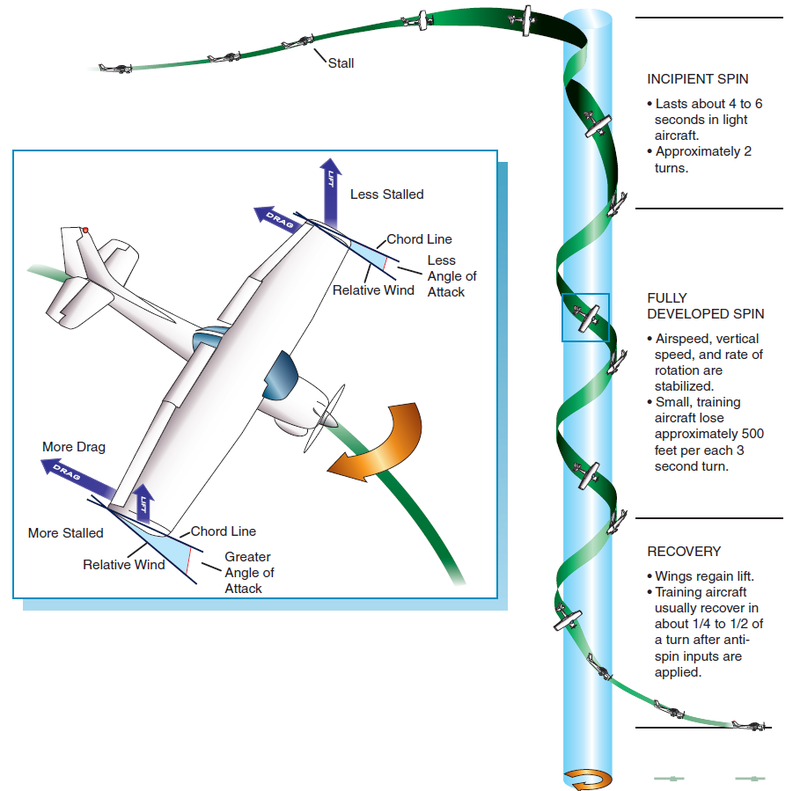 The amount of elevator movement applied must ensure the aircraft remains below critical AOA at speeds below Va and at a load less than the limited load factor of the aircraft at speeds above Va.
CASA’s recovery technique from a stall with a wing drop is fine for the usual practice straight stalls but note that rudder is really superfluous as forward movement of the stick will unstall the wing and the dropped wing can then be easily rectified with aileron. Some of you may be aware that aircraft certification requirements mandate use of the aileron for roll control at the stall – but note that is only for aircraft certified in recent years – we still fly many aeroplanes which were NOT certified to those requirements. Mishandling at the stall, say the classic skidded turn at low height, is quite different however in that the entry to the post-stall gyration is much more aggressive – this is the one that everyone should be wary of and know the immediate correct actions for recovery. Messing up an aerobatic manoeuvre is a similar situation although the altitude is generally higher. “The Super Decathlon stall characteristics are conventional. The stall warning horn will precede the stall by 5 – 10 MPH depending on the amount of power used. There is very little aerodynamic buffeting preceding the stall. If you are in something like a Pitts then it is essential to close the throttle – reduction of power tames this aeroplane. If in something more docile then power is a secondary consideration so initially don’t need to do anything with the throttle. If centralising the controls doesn’t have an immediate effect then you are on your way to a fully developed spin so remember those actions from my other article – the first action is power to idle so this is the time – do it now. If centralising controls is having a positive effect then you now get to decide what to do with the throttle. So, the pilot responded to the post-stall gyration by centralising the controls and applying power however the autorotation continued to develop into a spin. Application of power can have a significant adverse effect and aggravate the post-stall gyration. Reduction of power will eliminate that aggravating effect. If you know that application of power will not make the situation worse and you think it will reduce the height loss then by all means do it – but be absolutely sure that you are correct. Of course, this particular pilot had a parachute to recover the aircraft so a better option earlier on. Finally, it is very important to know how your particular aeroplane type behaves at the stall. What is the best thing to do in the type that you normally fly if you inadvertently start to spin at a low height? You must also consider your own experience and level of competency. How will you react if the aeroplane suddenly departs controlled flight at low altitude? It is all very well to know of a procedure to recover with minimum height loss but of little use if you mishandle the procedure and make it worse instead with application of power. A typical situation is the forced landing approach following an engine failure when your stress levels are already very high. Of course, in that situation, you don’t have power available to you anyway. APS has identified these common reflexive actions in initial stall/spin training – so, if a spin is suddenly encountered with nil training then expect one or more of these to occur which will make life much worse. e.g. “• Involuntary swearing and sweating • Continuing to hold the elevator control aft because of a dramatic, nose-down flight attitude • Inadvertently applying opposite aileron as a wing dips at the stall break, or as the airplane starts to roll into an incipient spin • Wildly shoving the elevator control forward”. Similar situation in the UK. CASA’s article goes on to state: “Whoever’s data you use, it’s clear that we need to know a lot more about stalls and spins, and how to avoid them.” And then: “To recover from a spin, lower the angle of attack (push forward on the controls) and stop the yaw (apply rudder opposite the direction of spin until rotation stops).” Really, is that really what CASA is promoting as the spin recovery technique after telling us that we need to know a lot more about stalls and spins? In June 2014 there was a serious spin accident involving a Chipmunk and the ATSB noted that: ” Furthermore, the pilot was taught a spin recovery method that was not effective for recovering from such spins in the aircraft.” It is interesting to note that CASA’s Part 61 MOS requires spin trainees to know “standard spin entry and recovery techniques for the aircraft being flown” only – wouldn’t it be good if they knew something about other types perhaps requiring different techniques. We will see that the above spin recovery technique promoted by CASA is generally ineffective in recovery from an inadvertent spin. So, perhaps loss of control is destined to remain the main cause of fatal accidents! It is interesting to compare the spin recovery instructions in the CAAP with that in the Flight Instructor Manual – now we have three different sets of spin recovery instructions from CASA with diddly squat explanation from the regulator. It is interesting that one method has elevator applied before the rudder and the other two have rudder applied before the elevator but, in one case a pause between the actions and in the other a “brief pause”. Why? How long is a pause? How long is a brief pause? Now to look at some more comprehensive notes which are available free online. Page 80 for fully developed spin recoveries – remember PARE! Page 83 for aggravated and inverted spin modes – remember PARE! “Power” – Reduce power to idle. “Ailerons” – Neutralize the ailerons (select flaps up). Do not allow ailerons to be deflected in either direction. “Rudder” – Determine direction of the spin and then push full rudder opposite the rotation of the spin and hold until rotation stops. UPRIGHT SPIN: Push elevator forward through neutral INVERTED SPIN: Pull elevator aft through neutral Some aircraft may required full elevator deflection to effectively reduce angle of attack sufficiently to recover. “Rudder” – Neutralize the rudder (very important, holding opposite rudder deflected during recovery increases the risk of entering a spin in the opposite direction). Isn’t that much clearer and more sensible than any of the CASA explanations? Of course, I must end with the usual disclaimer about some aircraft types requiring something different and that would be specified in the Flight Manual. Off course, the Beggs-Mueller or Finagin Antispin Recovery Technique (FART) methods are useful if you are absolutely sure that it applies to the type in all spin modes.